Blagdon was the terminus of the Wrington Vale Light Railway which left the Cheddar Valley Line at Congresbury. The station layout must be one of the simplest possible, requiring only 4 points. 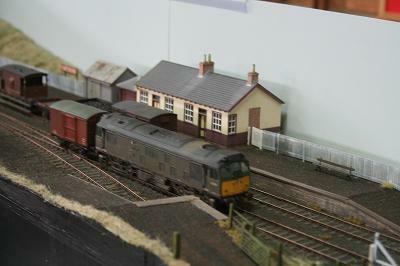 Yet it maintains operator interest with a regular passenger service and a small goods yard behind the station. The station building is typical of the style used on the line, the other being of GWR origin. There is no signalling, the branch being worked as one engine in steam. The track and point motors are Peco. The track is well ballasted in and weath- ered. Buildings are made from a mixture of card, plasticard, paper, corrugated foil etc. 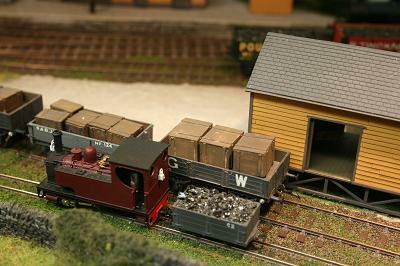 The stock is a mixture of proprietary and kit built, with a large section of kit built wagons. 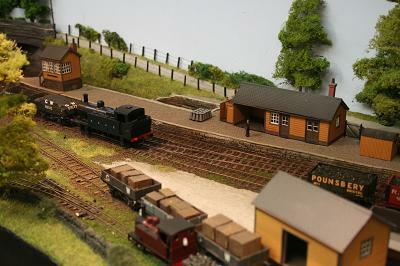 Chewton Mendip is a small intermediate station on the Somerset & Dorset Railway's little known Priddy branch. Built during the latter part of the 19th century, the branch left the Bath Extension at Chilcompton, passing Emborough and Chewton Mendip, then on to Priddy. Never much of a success, the residents of Priddy finding it easier to travel the shorter distance by road to Wells, the quarry at Emborough and the Brewery at Chewton Mendip providing more traffic. As a result of economies during World War 1, passenger services beyond Chewton Mendip were withdrawn, the line onto Priddy only remaining for the sheep fair, and a small amount of freight. 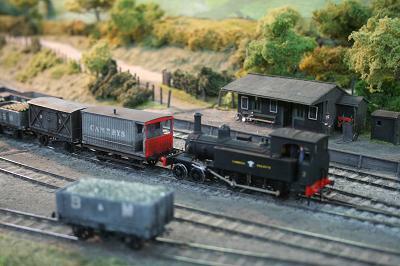 The layout is built to 4mm fine scale, with a track gauge of 18mm, EM gauge. 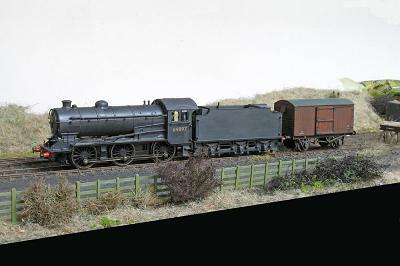 Plain track is S.M.P, pointwork handbuilt mainly on copperclad sleepering. 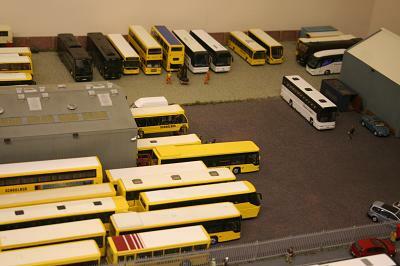 Buildings are mostly from Wills and Ratio kits, with some modifications, or scratchbuilt using Wills components. 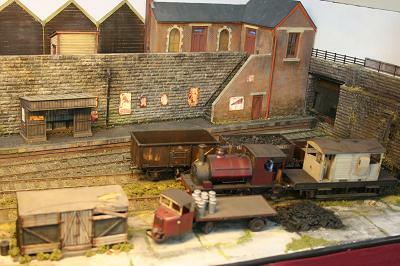 Scenery is a mix of Woodland Scenics, Hornby, Noch and Heki, trees being mainly Heki and stone walling Hornby ‘Scaledale'. Locomotives and rolling stock are kit—built from a variety of manufacturers, locos are etched brass, wagons and carriages mainly plastic. The layout has a boxed presentation, and is front—operated as this makes it convenient for home use. Hartburn is a small village in Northumberland. It was never served directly by rail but lay just north of the old Wansbeck Valley Railway from Morpeth to Redesmouth, with the nearest station being Angerton. However, the original plan put forward in 1855 to link Morpeth and Rothbury proposed a line running via Meldon, Hartburn and Longwitton. This proposition pre-dated the Wansbeck Valley. A survey and report was produced by John Willet but nothing came of the project and Rothbury was eventually linked to Morpeth by the Northumberland Central Railway (NCR) that joined the Wansbeck Valley at Scot's Gap. I have therefore based the plan for the layout on the assumption that this original route was built. 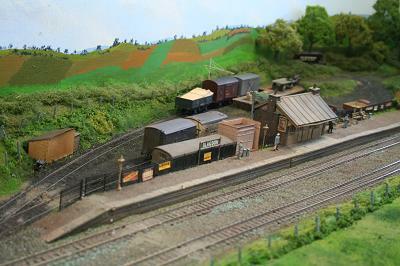 The track—plan is based upon an amalgamation of the 1862 and 1896 layouts for Angerton. 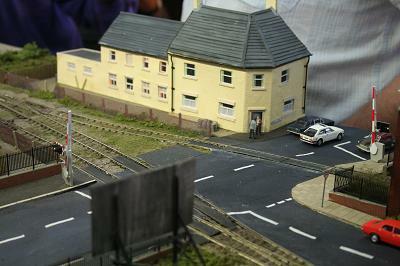 The station buildings are based on those at Brinkworth on the NCR. 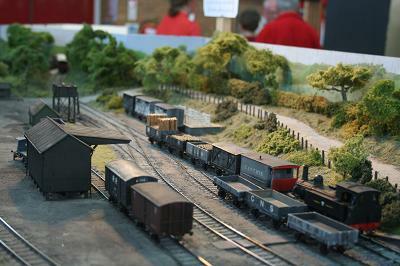 The layout is set around 1962/3 just prior to closure. 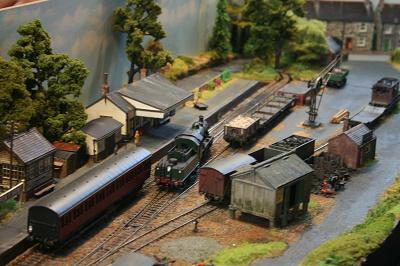 Occasional freight trains still pass through on their way to Rothbury hauled mostly by ex—LNER J27s. It is imagined a token passenger service is still in operation, being handled by one of the ubiquitous Metro—Cammell DMUs. The layout started out as a test track that quickly took on a life of its own. 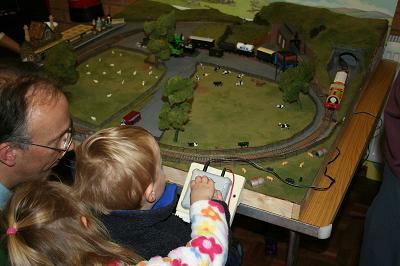 It has allowed me to experiment with rural modelling, having for so long modelled urban decay, and also see whether I can survive operating a three turnout layout for two days. 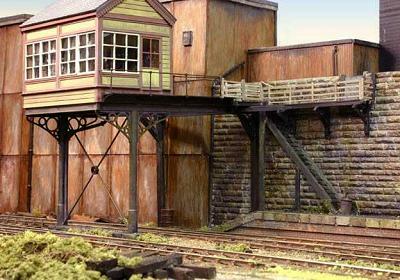 At just 15ft by 1ft 6in, this is a compact O Gauge layout of the interchange point between the British Railways line and the parallel light railway serving a small dock complex which we imagine is beyond the bridge. 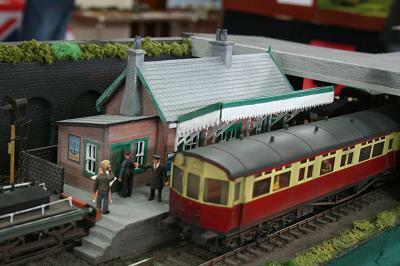 Passengers can change from the British Railways train which is more often than not a 'Derby Lightweight’ railcar to the adjacent light railway which provides a 'Galloping Goose' railcar for their passengers. Freight wagons are hauled up from the harbour by a variety of steam or diesel industrial locomotives, to be collected by the BR pick-up goods using the connecting spur. 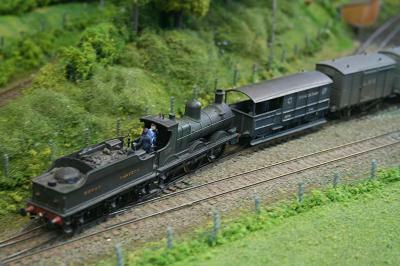 Larger BR tender locomotives often pass by New Harbour Junction as light engines on their way to a nearby motive power depot. 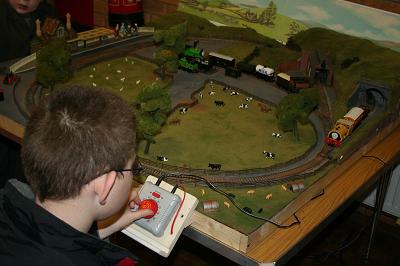 The layout can be operated to accommodate rolling stock from the different former BR Regions, including the Western, Scottish, Southern and London Midland. 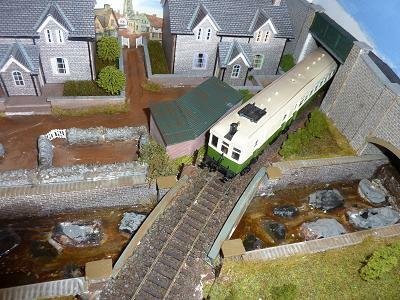 This layout is a British Rail Western Region branch line terminus based on what might have been if the Tanant Valley line of the Cambrian Railway had been developed by the G.W.R. The track plan is a cut down version of Aberaavon, as are the station buildings and other infrastructure. Layout operation is to a sequence with a mix of passenger, parcels and freight traffic. 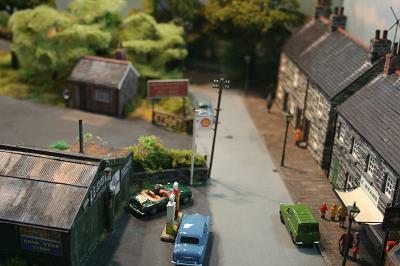 Talyllyn Road is based on an Ian Rice design from his book "Light Railway Layout Design", (Ettrick). The main difference being the move of location to the Welsh borders just east of Brecon from the Scottish borders. Although the number of items of Scottish stock sometimes make me wonder. It supposes a branch line similar to the Tanat Valley line just moved south and is operated by the Brecon & Merthyr and Cambrian in 1920. I still have not decided what the extension beyond the station serves, it may be a reservoir line or a military branch. The layout itself was built merely to run my ever expanding standard gauge stock, but seems to be taking on a life of its own. 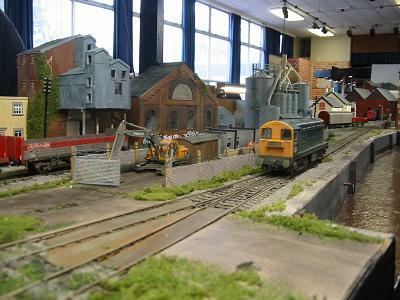 Wood Street is a minimum space industrial layout inspired by typical urban shunting yards that could be found in many towns and cities in England. The time frame is deliberately flexible to facilitate the use of different members stock. 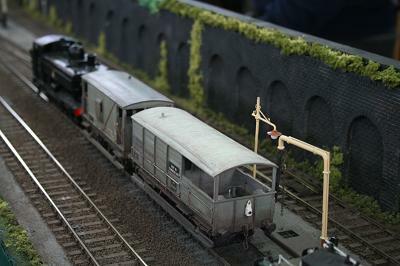 A variety of small tank engines and diesel shunters can usually be seen in operation on the layout, together with a wide selection of rolling stock. 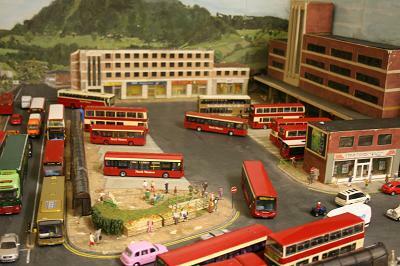 Structures and buildings are largely freelance although the layout Wood Street is partly derived from a road in the Old Town area of Swindon, which had rail access until the early 1970s. 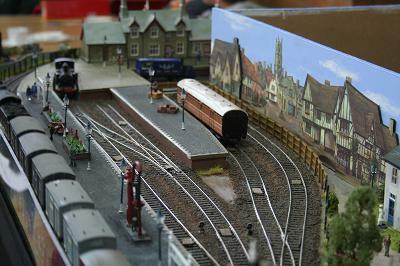 Trackwork on the layout, including the four points, are all Peco. No automated coupling system is used - instead shunting is reliant upon manual coupling of traditional 3-links.